I thoroughly enjoyed my friends and fellow scrappers last weekend. I am sure missing the fun girly time and late nights. I do not like that our retreat only happens once a year but I will take it. It is better than zero times a year, right? I was productive and maybe will have some time to share my creations with you this weekend. Real work took over upon my return so gotta love fun "work" when I can play with CUTE products that results in FUN creations! It has been a long week so I hope to enjoy a little bit of sleeping in tomorrow morning and some papercrafting the rest of the day! Enjoy your weekend! It Has Come to an End...but WE HAD A BLAST! This photo shows my team members and I - some who have been with me 10+ years! I LOVE that Close To My Heart is what brought us together. It is our friendships and love for papercrafting that keep us together. I would not change that for anything. I was productive this weekend and will be showcasing those creations but I just loved being surrounded by my friends and FUN! That is what I most enjoyed. I received another cute gift, this time from Molly Norwood, made from a Cappuccino bottle. She filled it with Reese's Peanut Buttercups! YUM! 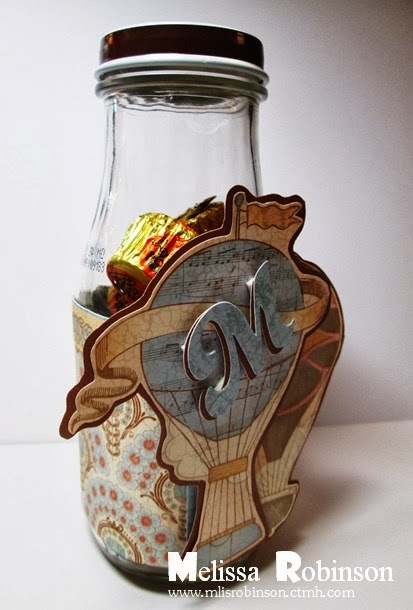 She used our new paper packet, Balloon Ride, to decorate it. 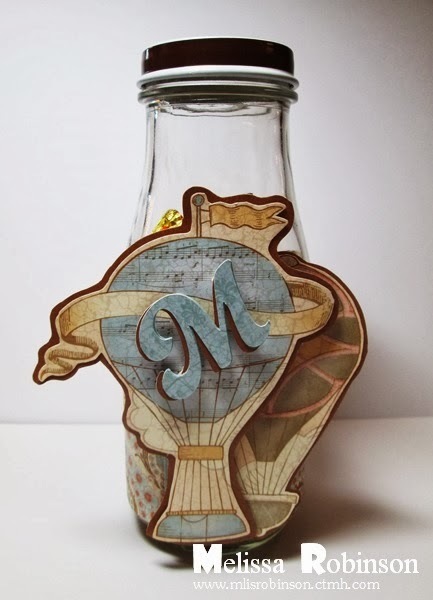 She cut the hot air balloons from the B&T paper, layered them on some Cocoa cardstock, and used 3-D Foam Tape. Fun, right?! Plus...gotta love that personalization with the M on the front - for Melissa, of course! 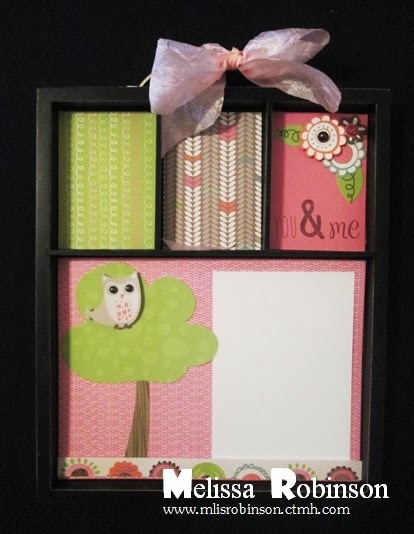 It is too fun to recycle things for cute gifts! LOVE it! Still havin' fun with my scrappin' friends! One of the fun things about scrapbooking retreats, besides just the good ol' girl fun, is the little goodies that are distributed. We are already receiving quite a few with our retreat just starting at noon today. The first one I am sharing, so I do not spoil it for the girls who have not arrived yet, is one made exclusively for me by my dear friend and downline, Melissa David. 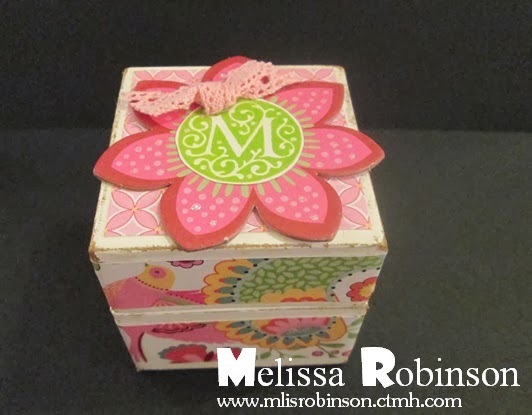 She used our My Creations Kraft Ring Box (look at the bottom picture to see what it started out as) and came out with THIS! Isn't it CUTE? 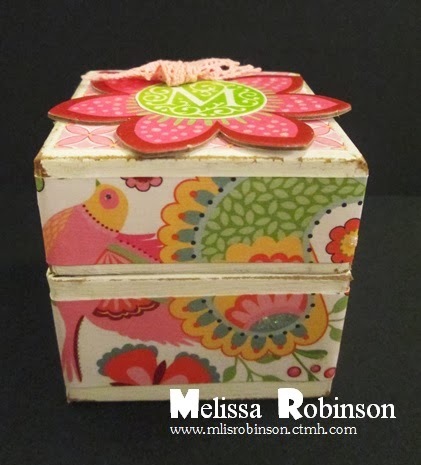 She painted and distressed the box and used Modge Podge on the dimensional elements and monogram. I love it! 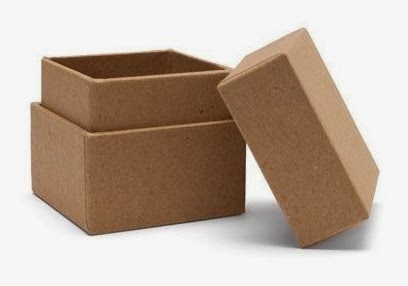 I have not purchased the box yet but...now I will since I see this GREAT potential for it! It is a good size, measuring at 2 1/2", so the gift for inside doesn't have to be tiny. In just four days, I will gather with my Mom and 26 scrappin' friends who will join me for a weekend of papercraftin' fun! It comes at a much needed time and I cannot wait! Our theme for this year is "Up, Up, and Away - Soaring to New Heights". I pray that for all of us both personally and professionally. We will be using our new paper packet, Balloon Ride, for the planned projects for the weekend and I think they have turned out really cute! I will share them next weekend after they are released to the retreat attendees. Of course, the girls will bring plenty of scrappin' supplies of their own. It is going to be a blast! We will join at Lone Oak Ranch & Retreat in Gainesville, TX (just north of Dallas) where we will party the nights away! It if it is anything like in the past, I'll return home next Sunday evening ready for a nap but it will all be TOTALLY worth it! We missed out on the event last year but I am sure we will make up for it! I do not know how much I will blog this week as I prepare to leave. It is tough creating things but unable to share the results since it is mostly going towards secret sister gifts and retreat projects. I cannot wait to share them all with you as soon as I can. I will miss those who are unable to join us this year and am looking forward to making new memories. Ready to see my girls! 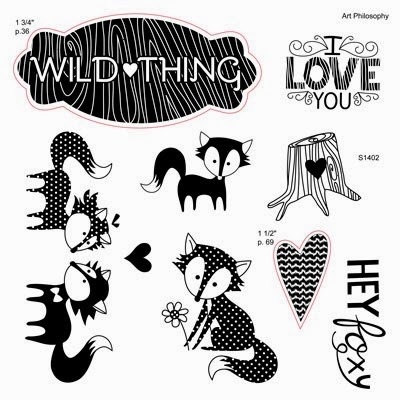 This month's Stamp of the Month, "Wild About Love", is perfect for February. It has CUTE sayings, fitting for Valentine's Day or any day of the year. You can purchase it outright for $17.95 or it can be yours for just $5 with a qualifying purchase! And...check out the artwork below the images to see some darling samples created with the stamp set, made by Close To My Heart's Art Department, that is not even February-related. These artwork samples are too fun and really showcase the versatility of the stamp set. If you have questions about how our Stamp of the Month program works, click here. What's awesome is this month, when you make a purchase to include at least two paper packets and get up to $50 on your order, you can get this stamp set for just $5 and one of our new embossing folders for FREE! That is a great deal only available this month! 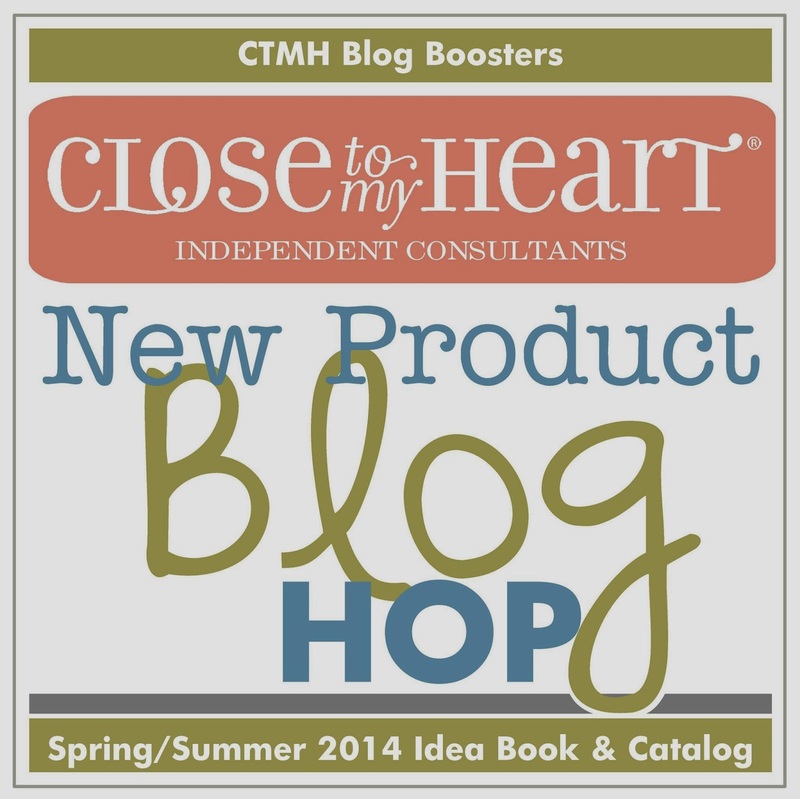 This CTMH year has been about Rediscovering CTMH. Each month there is a new download provided on my website and usually corresponds with a holiday or theme that month. This month's is totally appropriate with cute Valentine designs. Click here to see where they are provided each month and to download the PDF which contains eight images. You can use them for card sentiments, on your layout pages, for a Valentine treat...however you choose! Have a superb week and enjoy the downloaded images! Let me know how you use them! 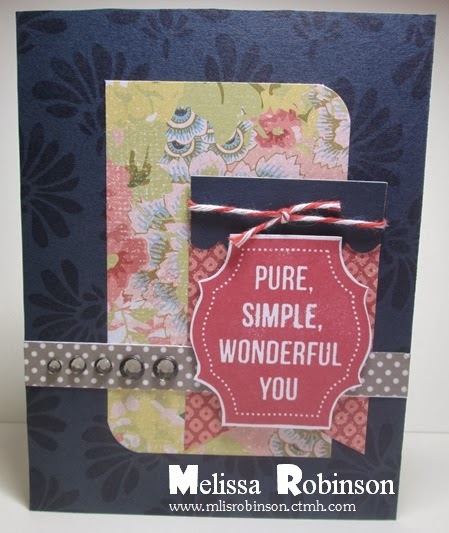 Welcome to the Stampers with an Attitude Blog Hop! The Stampers with an Attitude team members, with Close To My Heart, are excited to showcase some artwork entitled "Shimmer, Sparkle, and Shine". The hop is one big circle so feel free to continue through following the links. 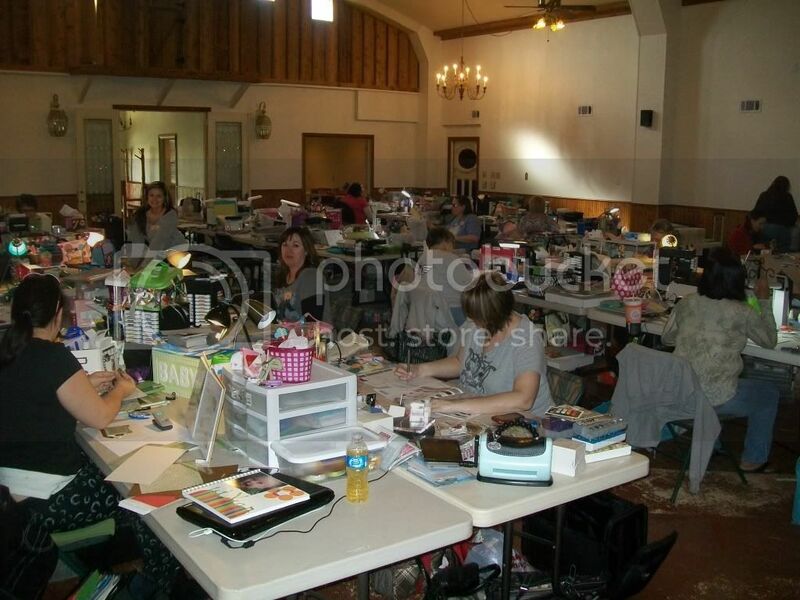 The blogger in front of me is LaJeania at Scrap 'Til You Drop so if you came from there you are on the right track! My interpretation of "Shimmer, Sparkle and Shine" had to include bling! Here is a close-up of the focal point on my creation. I included our Sparkles Flourishes and trimmed them to fit the area that I had allowed for them on the piece of Cocoa cardstock. I used some retired items for the owl's eyes and you'll see below, in the other pictures, that I have also included two Aqua Dots. I created this for the cover of a composition book. It is awesome how easily these can come together for a special gift or for note-taking purposes for yourself. I love, love, love this paper packet called "Lollydoodle". How can it not put a smile on someone's face?! I am absolutely fond of the BRIGHT colors and GORGEOUS images! I already know it will be a paper packet that I wear out! Well..it makes me happy so why not, right?! This is a close-up of the focal point of the book. I truly appreciate you stopping by and joining us on this hop. You are in for a treat when you check out what other artwork the participants have in store for you. Please consider leaving a comment and head on over to Keeley's Creations to view her fabulous creation! I know you'll love our new products just as much as we do! I decided to decorate one of our Clear Pillow Boxes using the gorgeous new paper packet called "Ivy Lane". The purple automatically drew my attention to this paper packet but it is much prettier in person than it is in the catalog (or even in this photo). I see great potential with the color scheme. I hope you enjoyed what I created and would love for you to leave a comment below. A supply list is also provided just in case you are interested in purchasing some of these fabulous new products. To view additional artwork, please click here and click on the images at the bottom of Tresa's posts. I know you will love what you see! Check out Close To My Heart's new, exclusive embossing folders. 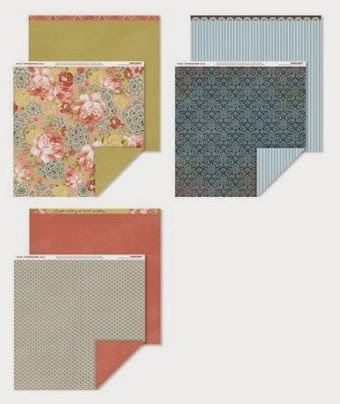 They are available in five trendy and classy patterns and they will have you wanting to transform all your patterned paper before you know it! This video will share some of the qualities of our folders and how to use them for different effects and get this... You can get all five of them this month, for FREE, when you make a qualifying purchase. Check out the links through the details found below the video. Click here to see details about the promotion. If you want to see what each design looks like, please visit my website. I am excited that four ladies from my team, and one awesome adoptee, are joining me this month to showcase one of our newest paper packets called, "Ariana". Each month, on the 5th day, we will showcase artwork created with new products and we are thrilled to start today! The hop is a circle, so keep moving through by clicking on the link at the end of my post or feel free to hop between blogs by selecting any of the links below. If you are coming from Marianne's Blog, you are on the right track! We truly appreciate you stopping by and hope you will leave some comments and let us know what you think of our creations. Happy hoppin'! To create what I felt was some much needed texture on the Outdoor Denim cardstock, I used the stamp set included with the Ivy Lane Workshop on the Go and some Outdoor Denim ink to stamp the floral image. Using one of the card patterns from the Make It From Your Heart, Volume 2, how-to book, I incorporated two different patterned papers for the design. I used an additional image from the stamp set to create the focal point, added Slate Polka-Dot Washi Tape, Sparkles Black & Grey Assortment and Harvest Baker's Twine to finish it off. Here is a close-up of those embellishments. 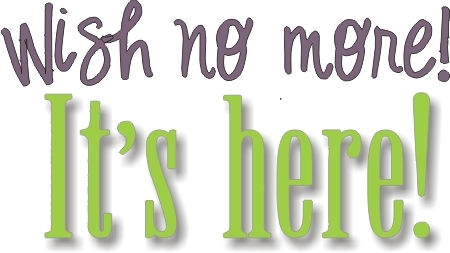 It has been fun playing with our newest products which were available to Consultants since January 1st! They went live to the public on February 1st and we are happy to showcase them for you over the upcoming months. Please click on over to Tonya's Blog, Heart and Soul Scrappers, to see what fun creation she has up her sleeve this month! Once again, thanks for stopping by and please consider leaving a comment. Here's to new products from Close To My Heart! One of many brand new products, in this Idea Book cycle, is the addition of CTMH-exclusive Embossing Folders and this month...you can earn them for FREE! During the month of February, you can qualify to receive a FREE embossing folder for every two packs of bulk single color or combo cardstock you purchase. Pick from our five new embossing folder designs - dot, chevron, quatrefoil, damask, or stripe - with your qualifying order. 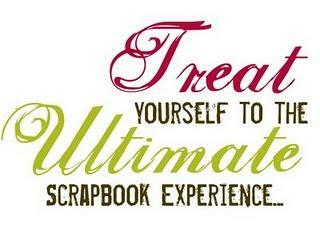 Every two packs of cardstock you purchase qualify you for an additional embossing folder. I know I will be stocking up this month! Make sure you act fast - designs are only available while supplies last! 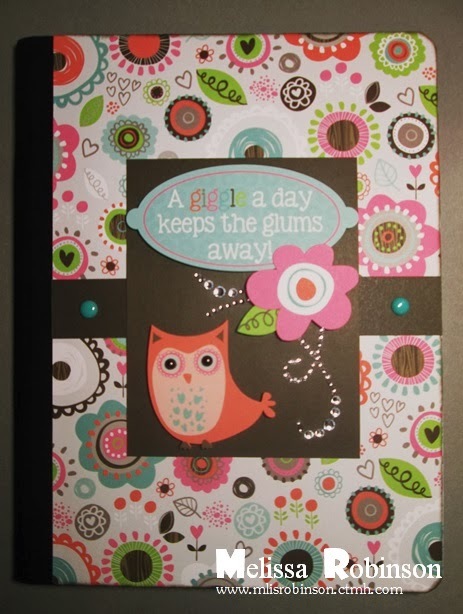 Click here to view the embossing folders designs and the cardstock options can be found by clicking here. If I can be of any help, don't hesitate to contact me. Happy Super Bowl 48 Sunday! Sit back, grab your favorite snack and peruse the new Idea Book. You can click here to view the online version. There are some beautiful new paper packets, fun stamp designs, and some brand new products you will want to be sure to get your hands on! Let me know, in the comments section, what your favorite new product is. You can shop 24/7 by visiting my website. Please click here to do so or feel free to contact me if you have any questions about our new products. I am looking forward to sharing artwork creations using them!